Anthony Mary Claret, Bishop - My Catholic Life! Today’s saint was a finely tuned, high-octane engine of evangelization. Anthony Claret was from Catalonia, the region around Barcelona, Spain. He studied for the priesthood in Rome, was ordained in 1835, and then returned to Spain to spend ten years giving missions. In 1849 he founded the Congregation of the Missionary Sons of the Immaculate Heart of Mary, more commonly known as the Claretians in honor of their founder. The Order was particularly focused on publishing works of devotion and piety, various books offering spiritual advice, and numerous pamphlets of basic catechesis. The Claretians filled a need and, as publishers, enjoyed enormous success. They published millions and millions of books and pamphlets. And all of this was Cspearheaded by Anthony, their founder, who not only was involved in generating doctrinal content but who also knew the technical details of printing, learned the business side of the industry, and edited the published works. In 1851, when Anthony was appointed the Archbishop of Santiago Cuba, the full array of his talents were put on display. He added the name of “Mary” to his baptismal name at his episcopal consecration and began a remarkably fruitful seven years as Archbishop. He traveled incessantly throughout his territory, restored the seminary, established hospitals and dozens of new parishes, and personally visited the sick and dying. He was ever present and provocative in his pastoral outreach, so much so that attempts were made on his life by the apathetic offended by his success. He was severely injured by one of these attempts but survived. Bishop Anthony was a true man of action. Creative ideas on how to spread the Gospel flowed constantly from his mind. Every tribulation and hardship was, for him, just an invitation to deeper commitment. It was nothing for Anthony to expend all of his energy one day and to wake up and do the same the next day. He was replenished by exhausting himself. In 1857 he resigned as Archbishop when he was recalled to Spain to become the personal chaplain to the Queen of Spain. This more sedentary life was a cross for Anthony, who was a born missionary. But he continued to dedicate himself to apostolic activity as much as his court obligations allowed. At the Royal Monastery outside of Madrid where he was assigned, he set up a science library, a school for music and languages, a museum of natural history, and a fraternity composed of cultural leaders and intellectuals that grew to national prominence. Anthony was such a motor of evangelization and cultural advancement that he earned powerful enemies who feared his success. They eventually drove him from Spain to France, where he died in 1870. Like so many saints, Anthony Mary Claret was a double or triple threat. He was so multi-faceted and so skilled in so many different fields that it is hard to believe that one man accomplished so much. He worked well and he worked quickly. Also like many other saints, behind his labors was a regimented life of prayer, Mass, the rosary, fasting, spiritual reading, self discipline and moral strictness. He was perpetually in the presence of God, and in his later years experienced spiritual ecstasies and performed miraculous healings. This incredible man of action and prayer was canonized in 1950. 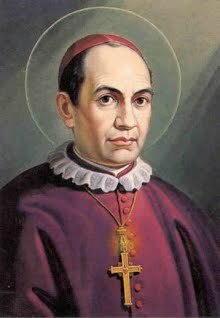 Saint Anthony Mary Claret, you outdid all your peers in dedication to Christ, Mary and the Church. We pray that you intercede in heaven to give all bishops the graces and the skills to lead their flocks in prayer, education and devotion as you did.